The beautiful new Kino Lorber Blu-ray release Pioneers: First Women Filmmakers is a revelation, a six-disc set featuring dozens of early films created by women, many unseen for decades. One of the biggest surprises was witnessing the Chaplin-Keaton-Lloyd alley appear in several films, each made years before the gents all filmed there. Above, matching views from The Purple Mask (1917), written and co-directed by its star Grace Cunard, and Buster Keaton in Cops (1922), both filmed looking east from Cahuenga just south from Hollywood Boulevard. In all, three early Universal films from the Kino Lorber set were filmed here. A trio of views, The Purple Mask, Harry Houdini in The Grim Game (1919), and Buster in Cops. It makes you wonder, if three early surviving Universal films were made here, as well as Houdini’s early Paramount release, how many films that don’t survive were made here as well? Perhaps a dozen? More? The alley is T-shaped, the east-west part with Buster appearing above. Here now is the north-south part, looking south at the back of some brick ovens appearing with Grace Cunard in The Purple Mask, and with Chaplin in The Kid (1921). Hollywood was sparsely developed during the mid-teens of the last century. The intersection of Hollywood Boulevard and Cahuenga was one of the few commercial corners in town. Since Universal was close by, the alley was likely used out of necessity or convenience. The Famous Players – Lasky Studio, where Houdini filmed The Grim Game, was closer still, just a couple of blocks away. Looking north up the alley, from Eleanor’s Catch (1916), starring and directed by Cleo Madison, and Charlie in The Kid. Twenty years ago, before hundreds of silent films became available to home viewers, I’d struggle to find a single location in a single film. Once solved, it somehow felt this must be the setting’s unique appearance on film. These early Universal films completely destroy this false assumption. Instead, it makes perfect sense that these locations were commonly known and frequently used. Thus, when Chaplin, Keaton, and Lloyd filmed here (for a total of at least six different films), they weren’t pioneers capitalizing on their own clever sense of locales. They were simply filming where everyone already knew to film. A closer view of the alley stairs, from co-director Lois Weber’s Where Are My Children? (1916) and Charlie and Minnie Stearns in The Kid. Another trio, Gale Henry in her self-produced comedy The Detectress (1919), Charlie and Minnie, and a scene from a later movie, The Last Edition (1925), a film that makes great use of the alley, and the common thread that originally tied all of the alley discoveries together. Views looking west down the alley from Cosmo towards Cahuenga, The Purple Mask at left, and Buster Keaton’s Neighbors (1920) at right. Notice the white shed to the right of center in both shots. The far side of Cahuenga across the street has no buildings in the 1917 view. Notice too the corner pole left of center in the Keaton frame – it appears below. This cast iron corner pole is still present, appearing in 1916 in Eleanor’s Catch, beside Lisa Marie as Vampira in the Johnny Depp biopic Ed Wood (1994), and a modern view today. Three views looking west towards Cahuenga showing the back of the alley loading dock, in The Purple Mask, Eleanor’s Catch, and The Detectress. Above, the Cahuenga entrance to the alley appearing with Colleen Moore disguised as a man in Her Bridal Nightmare (1919), and a scene from the Al Christie comedy Hubby’s Night Out (1917) linked on YouTube. Above, a 1919 view of the T-shaped alley. When Chaplin filmed scenes for The Kid here, the studio records note that on December 1, 1919, he filmed at “Hall’s grocery,” and the next day at “Hall’s alley.” Christopher C. Hall owned a grocery store at 6382 Hollywood Blvd., that backed onto this alley. Further, in 1913 he built the distinctive two story home on the alley at 1645 Cosmo (oval photo above), just steps from his store. So “Hall’s alley” was an appropriate name. The star above marks where the camera stood on Cahuenga to film the back of Mr. Hall’s home appearing in these three scenes above. Note: in Keaton’s view above the trees that belonged to the Jacob Stern estate are blocked from view by the Palmer Building on Cosmo nearing completion. 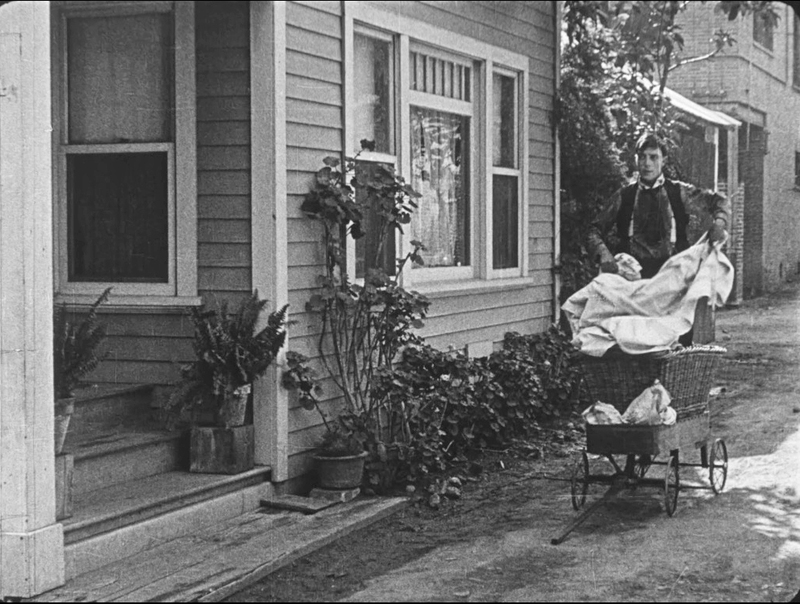 At right, Keaton hides in a laundry basket beside Mr. Hall’s home during Neighbors. Notice the corner cast iron pole behind Buster which still remains. The home was demolished in 1956. Above, more views of Mr. Hall’s house at 1645 Cosmo from Billy West’s Don’t Be Foolish (1920) linked on the Internet Archive. Check out Kino Lorber Blu-ray release Pioneers: First Women Filmmakers. Part of the Chaplin-Keaton-Lloyd Alley, a view west from Cosmo towards Cahuenga today, with Mr. Hall’s home long since gone. Zoom to see the corner cast iron pole still standing. This entry was posted in Chaplin - Keaton - Lloyd Alley, Hollywood Tour, Lois Weber and tagged Chaplin - Keaton - Lloyd Alley, Cleo Madison, Cops, Eleanor's Catch, First Women Filmmakers, Gale Henry, Grace Cunard, Hollywood Tour, Lois Weber, Neighbors, Silent Movie Locations, The Detectress, The Kid, The Purple Mask, then and now, Where Are My Children. Bookmark the permalink. Your research and posts are always so informative. Keeps making me want to visit that alley more and more. Thank you. Thank you so much, I appreciate it. There’s so much visual history hidden in early film.